While spring has sprung for most of baseball already, the Washington Nationals appear to be late bloomers, as they didn't play their first spring training game until today. 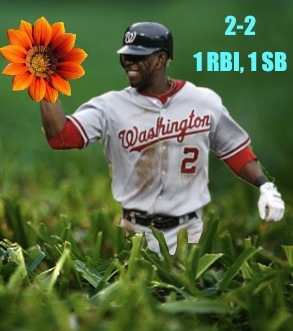 That said, the Nationals didn't restrain from blossoming against the New York Mets. In an overwhelming victory, Washington beat New York 9-3 in front of 3,400 fans. Of course, the question on everyone's mind is, "How did The Shark do?" The answer, "Pretty damn good!" Roger "The Shark" Bernadina, went 2 for 2, with two singles and a walk in his 2011 Spring Training debut. He also tossed in an RBI (on a smoked single to right) and a stolen base to make his sunshine stats shine a little brighter. You can't argue with a smooth 1.000 batting average. Unfortunately.... Mako Morse, the Shark's chief rival for the left field job went 3 for 5, with 2 home runs and 4 RBIs. Fear not, Shark fans. Spring is still young and a lot more baseball is to be played before Opening Day. Also, if Mike Morse had the best day for the Nationals, then Shark arguably had the second best. The Shark can still hit his way into the starting lineup, whether in left field or center field. Shark(Center)+Morse(Left)+Werth(Right)= BEST OUTFIELD IN BASEBALL... PERIOD! Sharks Don't Drink and Drive! Just how great is Roger "The Shark" Bernadina?